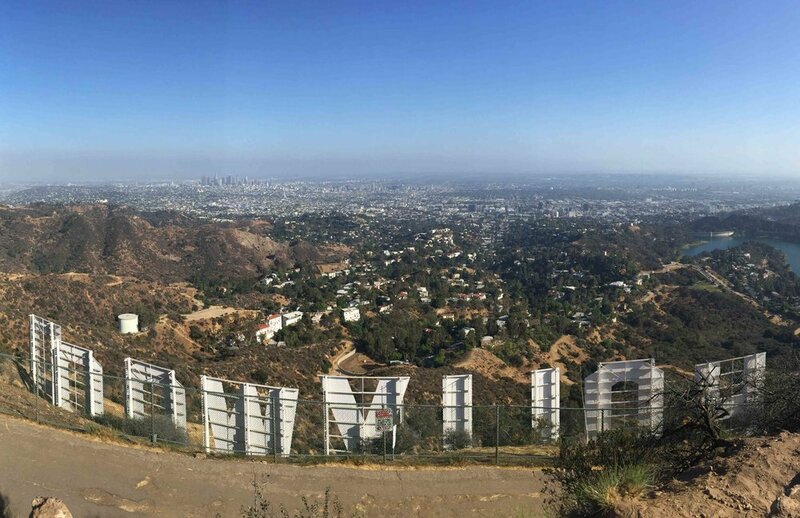 Warning: this adventure may give you ideas of stopping everything right now, book a one-way ticket to somewhere on the american continent and just live the life. Just a few months ago, Gaëlle, a French 25 years old graduate, came back from the very long and exciting trip from Alaska to Ushuaia. I asked her a few questions to know more about this incredible adventure. I warned you, it will definitely give you the travel bug! Marine: Can you introduce yourself in a few words? 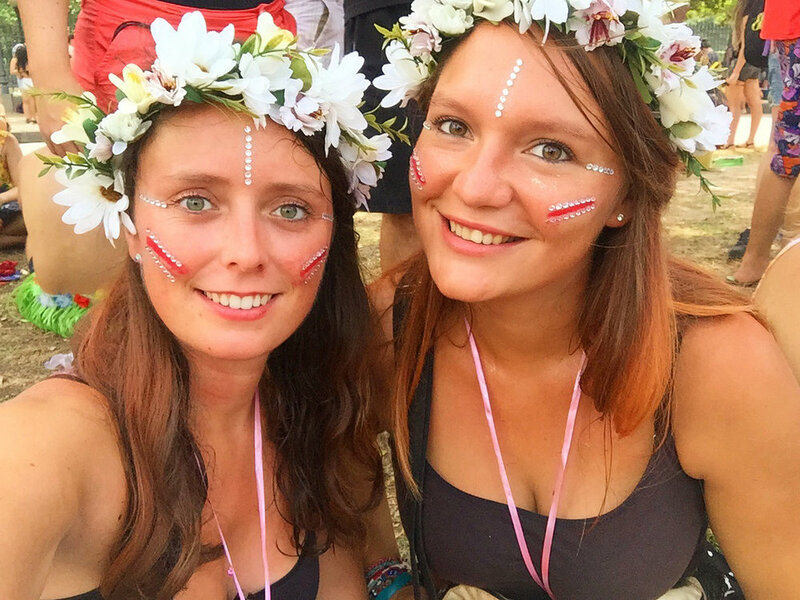 Gaëlle: My name is Gaëlle, I’m 25 years old and I finished my communication studies almost 2 years ago. During my licence, I studies for 6 months in Valencia, Spain, which gave my the travel bug. I lived there with a Mexican girl who is a friend since and who I saw for a month in Mexico three years ago. This was my only travel outside of Europe before this big road trip. Why did you choose this trip and what was your itinerary? For a few years, it was my dream to cross the american continent from North to South - so from Alaska to Ushaia. I thought this was a crazy thought so it stayed as a dream for a long time. But at the end of my studies, with no boyfriend, no kids and no job either, I thought this was the best time to leave. I got my flatmate to come with me and we were both on the road. At the start we planned to only do the USA, Costa Rica, Mexico and Cuba. We didn’t want to get too greedy at first but we still wanted to reach our goal ;). Few countries actually got added to the itinerary: Guatemala, Panama, Colombia, Ecuador, Peru, Bolivia, Paraguay, Brazil, Uruguay, Argentina, Chile and French Guinea. 16 in total! We left for 14 months. Let’s talk logistic. How did you do to finance your long trip and once there, how did you plan country to country? I financed with all of my savings from my (young) life haha! And I worked for 7 months between the end of my studies and the departure to save even more. But I may have borrowed a little bit of money from my parents at some point… I was lucky that they were encouraging me and wanted me to reach my goal. But I think our 4-day stay in the Amazon rainforest will stay as one of the best memory. We fished piranhas, built a camp in the jungle in which we slept in, met the local community living next to monkeys, snakes, toucans and more! We also saw some pink dolphins, chased baby caimans in the middle of the night, discovered medicinal plants which could cure lots of diseases here, talked about sexuality with the village chief and our guide while drinking caipirinhas… So many things I would never have thought of doing in my life! 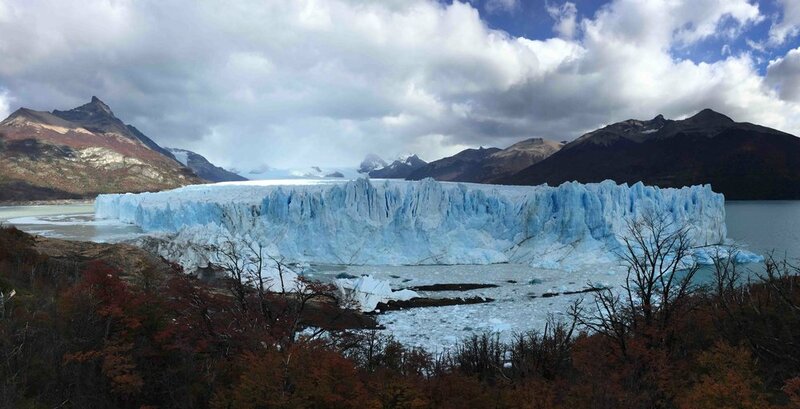 Glacier Perito Moreno, Patagonia, Argentina. There’s been the theft of my bag with cellphone, glasses, debit card on the beach of Copacabana. The very expensive 800 dollars bill in the Las Vegas emergency room for a tooth pain which no one took care of in the end (the doctor looked at the tooth with his Iphone light lol), the car breakdown in the middle of a tropical storm at the heart of Costa Rica…. But the most painful experience mostly concerned my friend travelling with me. While we were picnicking in San Francisco, some cucumber juice dropped onto her passport which made a little stain next to her photo. We took dozens of flights with this document without a problem until our depart from Guatemala where the ground crew staff refused to let her on the flight, saying the customs in Panama - our next country - were very strict and that they won’t let her in. We didn’t want to lose two flight tickets so I left alone thinking she’ll do an emergency passport and she’ll be here in two or three days. It actually lasted a month… The emergency passport didn’t work and she had to wait the digital passport from France but once it arrived, there were more problems. First, the embassy took her previous passport and she didn’t have the stamp of entry in Guatemala. Once this was solved, she booked her flight at the airport but couldn’t pay because there were some missing documents she needed to bring on her departure. But she couldn’t even get on this flight because after two hours of wait, on the departure day, they announced to her the seat had been sold. And finally when she could leave, there had been a blackout in the airport which almost made her miss her flight while a cyclone hit Panama - which also almost cancelled her landing. You can imagine I was extremely relieved when I saw her at Panama City Airport. It was definitely the most difficult time. Which tips would you give to travellers wanting to try this adventure? Just do it! This is usually the most difficult part because our subconscious stops us as it’s not easy to get out of our comfort zone. But to be honest, DARE to do it! You’ll never regret it. Practically, travel light (this wasn’t really our case haha…), research the seasons mostly for Central America to avoid rain seasons and cyclones (which we didn’t do either haha…) and keep a journal. It’s a bit heavy to do it daily but in the end, we were extremely happy to write down all of those memories and to be able to keep them forever. 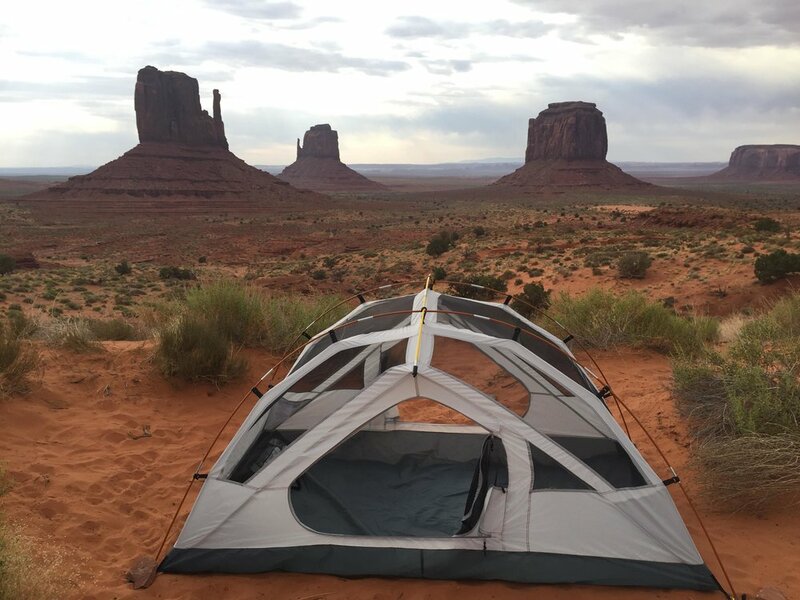 Gaëlle and Noëmie's tent in the middle of Monument Valley. Travelling alone as a woman is becoming more and more common but many are unsure to actually do it. What were your thoughts on this for such as long trip, and what’s your advice? I didn’t travel solo and honestly I don’t know if I would have been able to for such a long time. But during the month I spent in Panama and after all the stories from the girls travelling solo we met, it is totally possible. Wherever you go, you always meet people and you share moments and sometimes travels, so in the end you are never alone. Gaëlle and Noëmie with Princessa, an Anaconda of 4 meters length and more than 30 kilos in the Amazon Rainforest. My advice is to not have a plan that’s too set because it’s often following who you meet that will set what you’ll do next. You need to be open to the unexpected. My friend also gave me the French “L'art de voyager seule quand on est une femme”, [the art of travelling alone as a woman] which gave me some clues on lots of topics and proves it’s possible! Sambodrome Rio de Janeiro, Brazil. Of all the countries you visited, which one would you settle down for a while? I think I would choose Brazil and mostly Rio - a city where we stayed a whole month and we loved! The weather was beautiful, hot, there’s the sea and mountains, and the cariocas (people living in Rio) were so friendly. This city has a real cultural identity and a very rich history which makes it so interesting. And Brazil is so big, I think there’s enough travels to do for a long time. We didn’t do the Northern beaches but we heard it’s beautiful. And as they speak Portuguese, that could be a new language to learn for me! 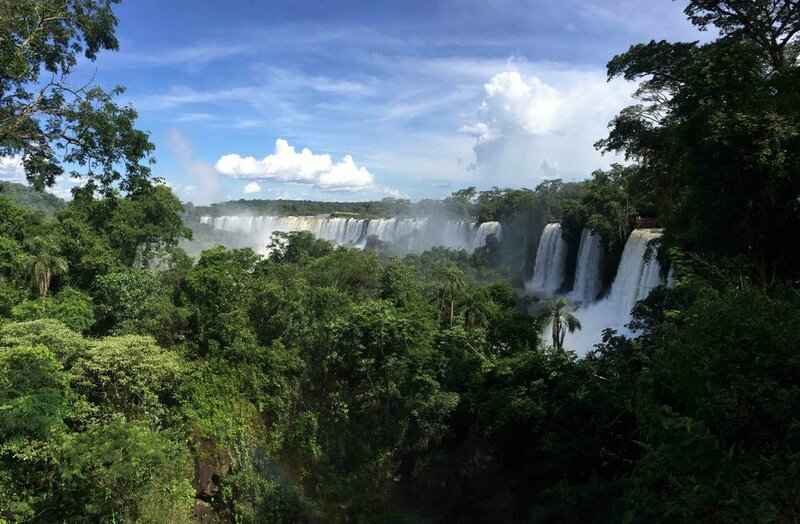 Iguazu Falls, Argentina and Brazil. 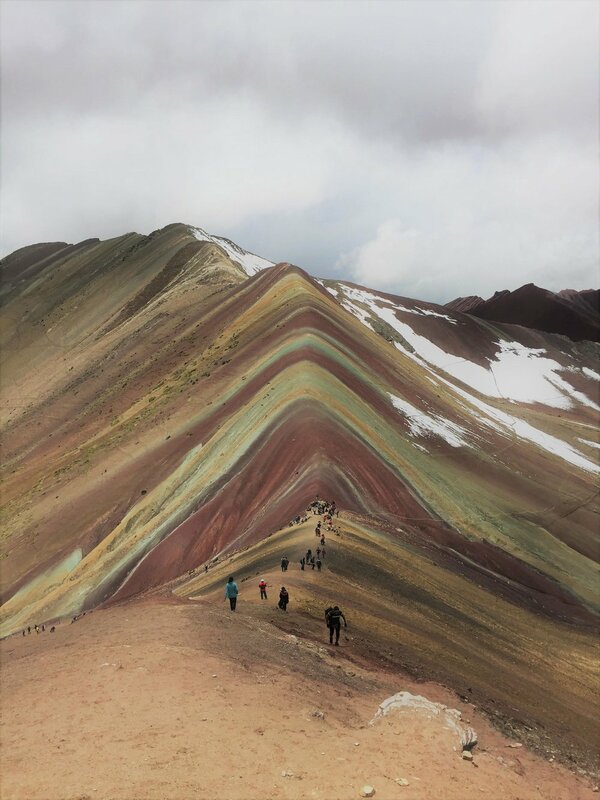 Vinicunca Mountain, said the 7 colours mountain, in Peru. Sunset on the canoe in the Amazon Rainforest. Monkey in the Amazon Rainforest.